Early in December I arrived at the InterContinental Chennai Mahabalipuram Resort in the midst of Cyclone Nada a little concerned if my visit would be a washout. As I entered the resort, I was already late for lunch and as luck would have it, I was greeted by lashing rains and sweeping winds. Just when my concern was turning to worry, I was warmly greeted by Executive Chef Ashis Rout who led me to The Melting Pot Cafe – the All Day Diner for a much needed lunch. As we settled into our seats, I could see the rain in all its glory and the water body overlooking the restaurant was awash with fresh water. My lunch began with the talented Chef Mahesh Ajay whipping up one delicacy after the other. Starting with a fresh juice, the continental spread I sampled was amazing. Again each dish is a work of art here and the emphasis on presentation as you can see from these pictures are amazing. The best part is that the taste shines through and that is what makes the food here a winner. Whether it is the soft pita bread with hummus, focaccia with dips, soup or desserts, the attention to detail is amazing. Showcasing a unique concept of a travelling market, The Melting Pot: Market Café presents culinary delights from three live kitchens –European, Pan Asian and Peninsular Indian. The culinary team here curates degustation menus in accordance to cuisine preferences and being a vegetarian who does not eat mushrooms and eggs, the Chefs went all the way out to ensure my breakfast, lunch and dinner were unique and different. Since I mentioned I liked pongal, I was given arguable one of the best pongal’s I have eaten – soft, wholesome with a crunch of curry leaves, pepper and cashew that made a great start to the day. The next day Chef Ajay, actually gave me an authentic South Indian thaali for breakfast complete with a mini masala dosa, vada, pongal, puri and an assortment of chuntneys. For lunch I sampled an Oriya Thaali – Chef’s Ashis is from Orrisa and if you have not tried one, do so now.The thaali has an extensive use of eggplant and each and every item has a different taste. What worked for me was that the spice factor is perfect and never for once overpowers the food. Tao of Peng is a contemporary Chinese cuisine restaurant that takes you on a culinary journey through the Sichuan and Canton regions of China. From the modern design and decor with indoor and outdoor seating this restaurant’s unique name is inspired by Chef Peng Zu, known as the master cook of the Imperial Palace, who made the traditional recipes accessible to diners across the world. Tracing in his path, also known as ‘Tao’, the restaurant presents a modern interpretation of authentic recipes; here, emulsions are spooned, foams are whipped, garnishes placed with perfect precision. What do I say about my meal here? Chef Avinash Naha and his team whip up a meal far beyond my expectations. I literally saw magic when a dimsum platter was whipped up right in front of my eyes. The end result looked like a work of art and the numerous dimsums were yummy. My favourite was a fried dimsum that tasted like a puff! The Lotus Root with Wasabi emulsion, Belgian endive and crushed black pepper and the Dan Dan Noodles made with Corn, asparagus, edamame, peanut sauce, micro cress, Sichuan pepper corn were some other dishes I sampled. I rounded off the meal with a platter of everything chocolate – absolutely sinful and supremely tasty! This is a unique concept that the resort has thanks to the fact that it has access to the beach where there are very few people making it like a private beach – well almost! A private tent and a table with the ocean touching your feet is set up. You can choose the signature ‘Wine By Design’ experience; select a bottle of fine wine, handpicked from vineyards across the globe and a personalized menu of appetizers to go with it. Or choose to ‘Dine By Design’, and enjoy a delectable meal curated by your own personal chef. With an abundance of aphrodisiacs and live music setting the mood, it promises to be an unforgettable dinner by the Bay of Bengal. Naturally this is most popular with couples especially non their honeymoon! 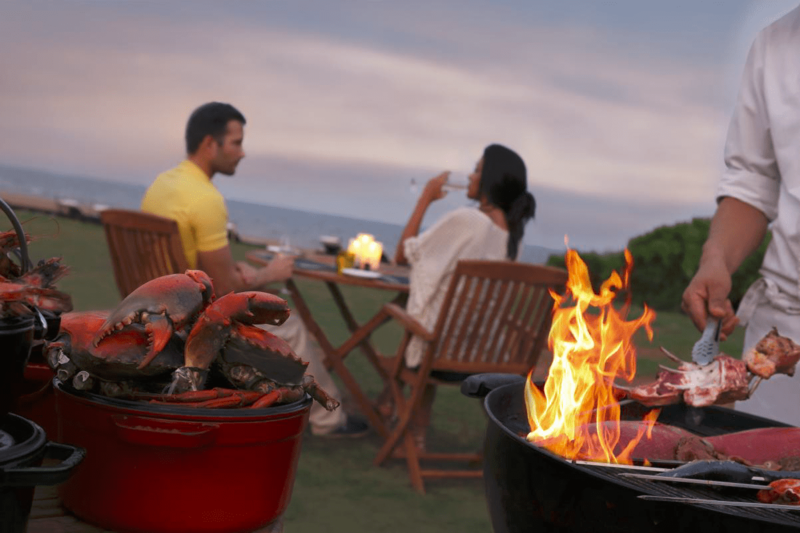 Every Saturday, weather permitting, you can enjoy heady Sundowners with live music and flowing spirits by the Bay of Bengal at the Intercontinental Chennai Mahabalipuram Resort. The best company you have is of the endless sea and the limitless breeze that makes this an absolutely fantastic experience. To simply put it dining experiences here are fantastic – whether you are a foodie or not, you will always enjoy a meal at the Intercontinental Chennai Mahabalipuram Resort. And if you are on a holiday, a great meal can only accentuate it further. So if you are planning to take a holiday that combines good food with everything else you know where to go. Thank you Chef Ashis Rout, Chef Mahesh Ajay & Chef Avinash Naha. 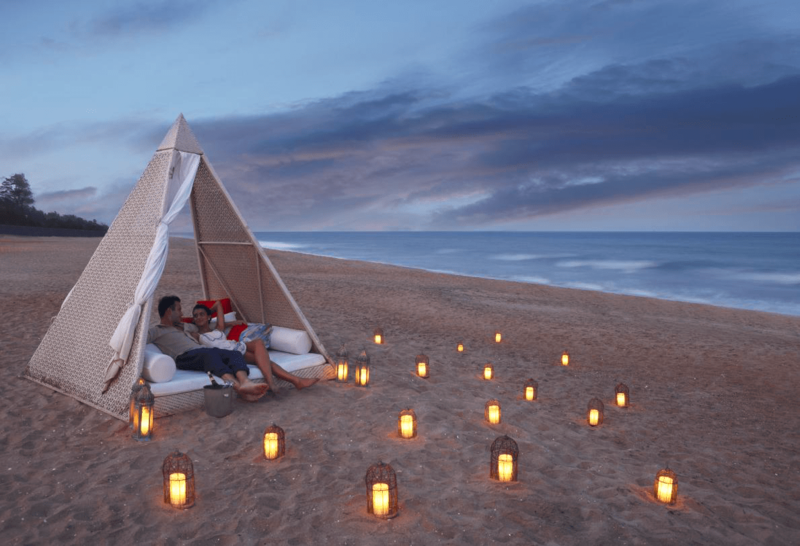 To know about what else you can do here read my story on the Intercontinental Chennai Mahabalipuram Resort here. Thank you Chef – I hope I did a small tribute to your immense talent! Really my best meals were at your resort and I will never forget that juice platter you made! Thank you for your time , we loved it . 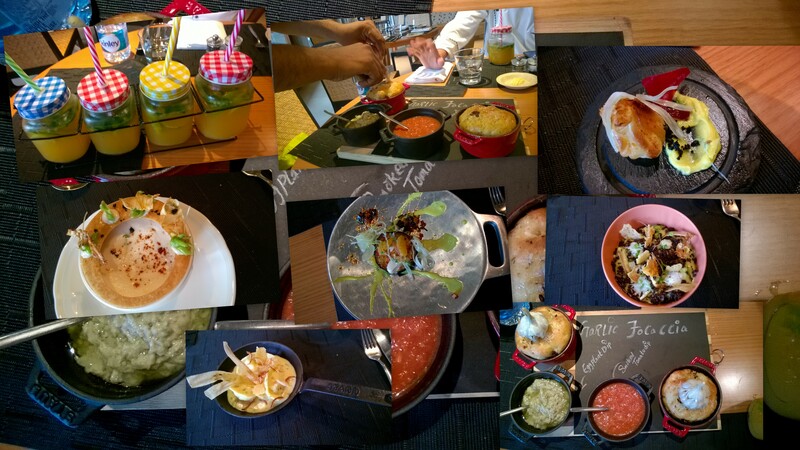 Thanks Chef – for your time and also allowing me to sample some of the best food I have had in recent times!